Buy this item and earn 5,999 ClubPoints. For exceptional quality and security, fiber optic extension is the best solution. FDX-M4P can go the distance with multi-mode fiber optic cabling with a reach of up to 1,400 feet. 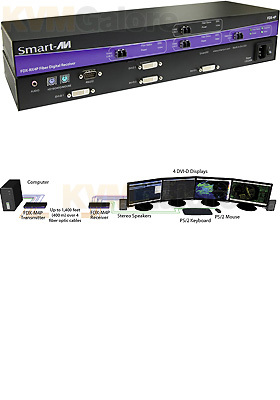 FDX-M4P is capable of supporting four DVI-D monitors, with PS/2 keyboard and mouse, stereo audio with serial (RS-232) control. The system includes a transmitter and receiver, which are connected by four fiber optic cables. The transmitter connects to the user's computer with the necessary cables, while the receiver connects to the remote interface devices up to 1,400 feet away.